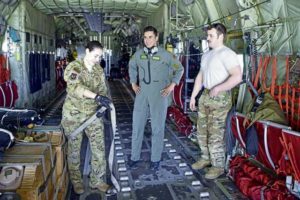 Moroccan Lt. Archiche Alaedin, a Royal Moroccan Air Force pilot, observes two 37th Airlift Squadron C-130J Super Hercules loadmasters rigging cargo before conducting aerial training during exercise African Lion 2019 on Kenitra Air Base, Morocco, March 25. During the exercise the 37th AS conducted approximately 24 low-cost, low-altitude parachute drops. African Lion 2019 is an annual, combined multilateral exercise designed to improve interoperability and mutual understanding of each nation’s tactics, techniques and procedures while demonstrating a strong partnership between the nation’s militaries. As the annual exercise African Lion 2019 wraps up, approximately 1,100 U.S. service members prepare to redeploy out of the Kingdom of Morocco and Tunisia. Exercise African Lion 19 is a combined, multilateral exercise with aim to improve interoperability and mutual understanding of each nation’s tactics, while demonstrating the strong bond between their militaries. For this exercise, the U.S. joined armed forces from several other countries including Canada, France, Morocco, Senegal, Spain, Tunisia, and the United Kingdom. Each of the four U.S. armed branches participated in the exercise, to include U.S. Airmen from Ramstein. The 37th Airlift Squadron, the 86th Logistics Readiness Squadron, the 86th Aircraft Maintenance Squadron, and the 435th Air Ground Operations Wing helped support the aviation training exercise portion of African Lion 2019 along the Moroccan coastline. 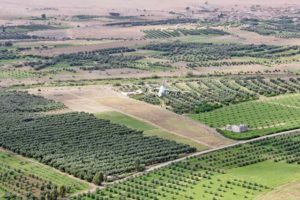 During the two-week exercise, U.S. armed forces personnel along with the Royal Moroccan Armed Forces operated out of a number of locations, to include Kenitra Air Base, Morocco. There, the Airmen conducted extensive training, including approximately 120 flying hours, low-level mountain flying, aeromedical evacuation training, 122 joint-personnel drops, 102 static line jumps, and 24 low-cost, low-altitude parachute drops. Walker said the 37th AS contributed to one of the exercises’ main objectives of countering violent-extremist organizations by training hand-to-hand with the Royal Moroccan Armed Forces on military freefalls; high-altitude, low-opening operations; and the low-cost ways to do airdrops to resupply their forces. The 37th AS also conducted dirt-landing zones to help train the Royal Moroccan military on how to insert and extract their teams, while also being able to resupply their forces with heavier equipment that can’t be airdropped. This iteration of African Lion was a year of firsts: the first time Royal Moroccan military personnel conducted free-fall operations onboard a U.S. aircraft; the first time the 86th Aeromedical Evacuation Squadron conducted contested scenarios in the U.S. Africa Command; and the first time Royal Moroccan medical personnel conducted medical scenarios on board a U.S. aircraft during a flight. “Last year was the first time we came to this exercise, but we were only able to table talk and show off our static displays,” said Capt. Sara Hidinger, an 86th AES flight nurse. “This year we were actually able to put the Royal Moroccan medical personnel on a U.S. plane. I was floored at how well they were able to jump into any medical scenario. We were able to build a great relationship with our medical counterparts.” Though the U.S. and Royal Moroccan armed forces aimed to sharpen their own individual skills by training in unfamiliar settings, the main objective was to strengthen relations and for each nation to successfully operate in conjunction with one another. “The Moroccans are a very capable partner and the more we get to practice our operations together, the greater we build our partnership capacity,” said Capt. Joshua Kelsey, a 37th AS pilot and African Lion 2019 mission commander. While African Lion 2019 enabled the training of U.S., Moroccan, Tunisian and other allied and partner forces, it was also reinforced lessons learned from past African Lion exercises and provided a foundation and structure for future military cooperation and engagements. Kelsey said that African Lion 2019 was a success and he looks forward to integrating with the Royal Moroccan forces next year. Members of the 435th Air Ground Operations Wing and Royal Moroccan Armed Forces paratroopers participate in a parachute jump training from a U.S. Air Force C-130J Super Hercules during exercise African Lion 2019, March 26. 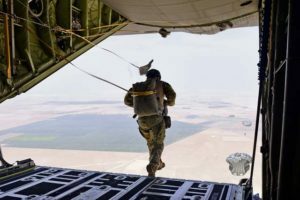 The 435th AGOW and the Royal Moroccan Armed Force paratroopers conducted jump exercises to enhance interoperability and maintain jump efficiency. A U.S. Air Force C-130J Super Hercules with the 37th Airlift Squadron conducts a low-level flight over central Morocco during exercise African Lion 2019, April 1. 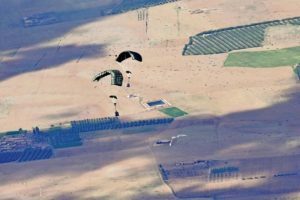 The 37th conducted several low-level flights to train their pilots and loadmaster in low-cost, low-altitude parachute drops. U.S. Airmen with the 37th Airlift Squadron use a Joint Precision Airdrop System to GPS-guide its cargo directly onto a target in central Morocco during exercise African Lion 2019, April 1. The U.S. Army’s 5th Quartermaster Theater Aerial Delivery Company provided the JPADS equipment, rigged the load and packed the parachutes.